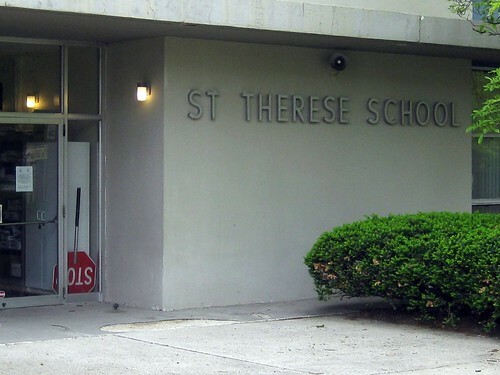 As I've mentioned before, when the second semester of 4th grade rolled around, my mother had us moved over to St. Therese Catholic School. I don't know exactly why - it's on my list to ask my mom about one of these days. I know it wasn't because of Mrs. Crowley or anything going on at Indian Village. I'm guessing that her Catholic conscious got to her...but who knows...You would think that the weekly CCD classes would have been enough for her but noooooooooooo. Going from Indian Village to St. Therese was quite a change for me. 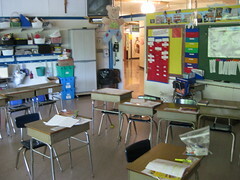 At Indian Village, you would have multiple teachers and classrooms for each grade. Here, there was one classroom and one teacher for each grade. Also, there was no cafeteria. You ate your hot/cold packs in your room at your desk. My first teacher (which was in fourth grade) at St. Therese was Mr. Bill Wunderlin. What can I say about Mr. Wunderlin? I wish I had a picture of him to show you because it would speak better to him than I ever could. He was a tall (but not too tall), thin man, who almost seemed out of place at my catholic grade school. He was friendly - but quiet. He was a man fond of routine, stability, and discipline. Every afternoon, as we were preparing for the end of the school day bell to ring, he would put on his overcoat and reach for his black, pointy, tall umbrella. There was a hat also somewhere in this equation however, not once did I see him put it on while in the building (a sign of respect - I'm sure). Mr. Wunderlin was passionate about two things. First, he was really into local theater. I don't know if he was an actor or a behind the scenes guy. I just know that lots of his free time was spent doing theater stuff. Second, there were these cloth banners he used to design and sew for the church. They were colorful, meaningful, and just generally stunning. I have a confession to make. Mr. Wunderlin was the first teacher to ever indulge me re: one of my classroom crushes. Every so often, Mr. Wunderlin would rearrange our desks. I'm sure this was a way for him to keep us on our toes. How would he decide who would sit where? That's where the class came into the picture. He gave each one of us a grid to complete. Our job was to take all of the names of the kids in the class and place them in an order that we thought was "good" or "right". So, when I completed my grid, I put myself next to the hunkiest guy in the room (Gregg Jehl). I put my friend Tiena Spears close by, along with the guy she was "going steady" with - Bobby Braun. Gregg was blond, athletic in a baseball kind of way, and just hot (for your typical fourth grader that is). I wasn't usually into blond guys (Tom Stinson - my crush at Indian Village - brunette all the way) so I attribute this to turning over a new leaf. A catholic school leaf I guess. I put my on-again/off-again good friend/arch-enemy Alice Jordan - in the opposite corner, next to the goobers (who shall remain nameless - because they may be reading this and they may not be goobers anymore). I remember - just like it was yesterday - when Mr. Wunderlin picked my grid as the floor plan for our new desk arrangements. Inside, I was all lit up. Outside, I pretended to protest - just like everyone else. You see, when Mr. Wunderlin selected a student's grid, he would never share with the class, whose grid it was. Not like I was going to volunteer that information. No sireeee... I was fairly new at the school and I had no intention of making enemies out of everyone in this one room class. Photo: Taken October 1977. Four fourth grade friends out at recess, on the playground of St. Therese Catholic School. Old church which has now been demolished, sits in the background. (Back and left to right) Mary Coffee, Kristina Frazier, Theresa Dodane. (Front and center) Alice Jordan. My sister Patty - Patricia Joanne Frazier - was born approximately 11 months after me (September 13, 1967). 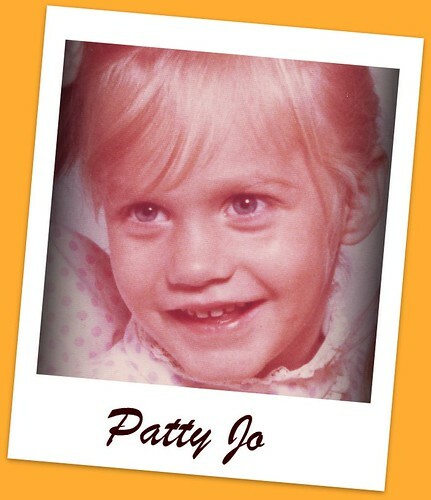 Patty Jo - well - we were (and are) two totally different beings. Her - with her blond hair and blue eyes - me with my reddish-brown hair and brown eyes. She was petite. I was tall. She was artistic. I was "bookish". We shared a room for many years and let me tell you - that was both a curse and a blessing (but more on that later). For her half-day of Kindergarten, Patty had Miss Crouse (soon to be Mrs. Ludwig). I made the assumption that when Patty moved to first grade, she would have Mrs. Lawson too (like I had). But when we went to pick up our information packets from school, I learned that she was going to be in Ms. Ballinger's class. As a seven year old, I knew three things about Mrs. Ballinger. First, she was a tall, thin lady with dark dark hair. Second, her classroom was all the way over there and she didn't have as many students as some of the other teachers. Third, the woman was obsessed with bears. As in the stuffed kind. When I scanned the information directory (a black, felt board, encased in class, located right inside the front entrance), it said that Mrs. Ballinger was a "Reading Readiness" teacher. Huh? Reading Readiness?! Yep. It was explained to me that this was a grade which was between Kindergarten and First Grade where kids who had difficulty with some of the basics - phonics, reading, etc...were placed so that they could have an extra year of intensive attention dedicated to bringing them up to snuff. My sister thrived in Reading Readiness. Mrs. Ballinger was just what she needed. Through the extra and intensive 1:1 time with her teacher, we learned that she had dyslexia (although I'm not sure if in the early 70's - they called it that). In addition, Mrs. Ballinger figured out that my sister was an artist and she somehow facilitated an opportunity for my sister to gain additional instruction through the Fort Wayne Arts School. It must have been free because there would have been no way that my family could have afforded to pay for it. Two days a week, my mother would drive my sister over to the school (I think it was Wednesday after school and Saturday mornings). The building pictured here was a familiar site for me as I always had to ride along. Truth be told, I was a little jealous that my sister was getting all of this attention. I couldn't even color within the lines and here she was, whipping out these masterpieces which were oooooed and awwwweeeedddd by adults everywhere. Even today, I am still completely envious of how she can hand sketch a mural on the bedroom wall of one of her kid's room's. The results are always beautiful and I curse the heavens for not blessing me with the same talent. And just to be clear - I can now color within the lines...I just choose NOT TO :). When I went back to Indian Village in May 2008 to visit, I learned that Mrs. Ballinger had passed away in 2003. When the school underwent remodeling, they created a mural to honor her. As I looked at it, I smiled. And then I thought about my sister. She was incredibly lucky to be in a school system which recongized that she needed extra assistance before entering first grade. And then, to have a special teacher like Ann Ballinger - that was the icing on the cake. That woman was far ahead of her time. 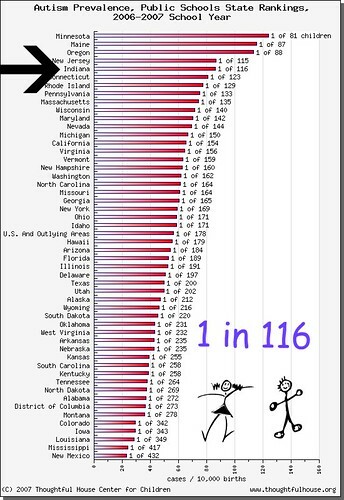 Her individualized approach to solving the challenge of - why is this child having difficulty reading was just so rare. The impact she made on students like my sister - that's a legacy we'd be all lucky to leave behind. ANN D. BALLINGER, 74, of Fort Wayne, died Monday, Dec. 1, 2003, at Lutheran Hospital. Born Aug. 22, 1929, in Logansport, she was a 1951 graduate of Ball State with a Masters degree from St. Francis University. Mrs. Ballinger was a Fort Wayne Community Schools teacher, who taught for 40 years, retiring in 2000. She began teaching in New Castle, in 1951, and moved to Fort Wayne, in 1952. She taught at Old Lakeside Elementary, Ward Elementary, Lafayette Center Elementary, Waynedale Elementary and Indian Village Elementary . She was Secretary for the American Association of University Women, Secretary of the Fort Wayne Womens Club, a member of the Local, State and National Reading Associations, Local, State and National Retired Teachers Associations, Coordinator of Project Read at Indian Village School, and a member of Phi Delta Kappa Educational Fraternity. She is survived by her husband, Norman H. Ballinger of Fort Wayne; sons, John S. Ballinger of Fort Wayne, Steven K. Ballinger of San Francisco, Calif.; granddaughter, Lauren Ballinger, of San Francisco; and brother, William Reutebuch of Chicago. Private service is Friday at Klaehn, Fahl & Melton Winchester Road Chapel, 6424 Winchester Road, with visitation from 2 to 4 and 6 to 8 p.m. Thursday. Memorials to Project Read at Indian Village School. Oh boy - anybody freaked out by the title of my blog entry today?! I bet that most of you forgot about those three little letters S.R.A. 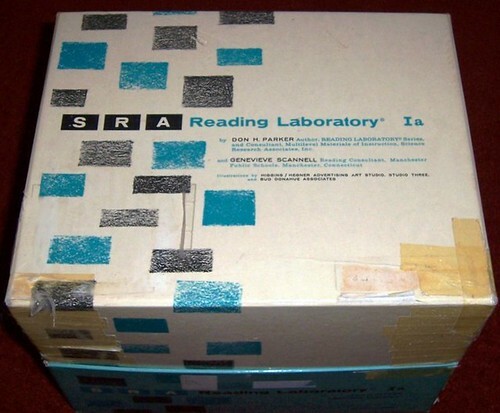 For those of you kids who are oblivious to the acronymn - S.R.A. = Science Research Associates. In the elementary years of FWCS in the 70's, this was apparently one of the successful methods to reinforce and/or test on concepts that were taught in the classroom. Yep - kind of like our own version of the ISTEP. Do you all remember the special desk cubbies that were in the library? 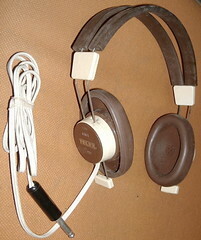 They were hooked up with "audio" which consisted of some SRA exercise, big ole headphones (kinda like these) and a book which looked like this. They would play the SRA exercise on some tape player and the sophisticated audio system would beam it out to the 4-6 of us who would be sitting in these cubby desks, listening intently to every word of the speaker. 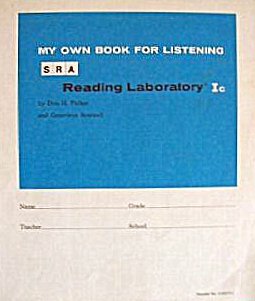 Then, we would have to answer questions or write something down in our little SRA books about the listening exercise. 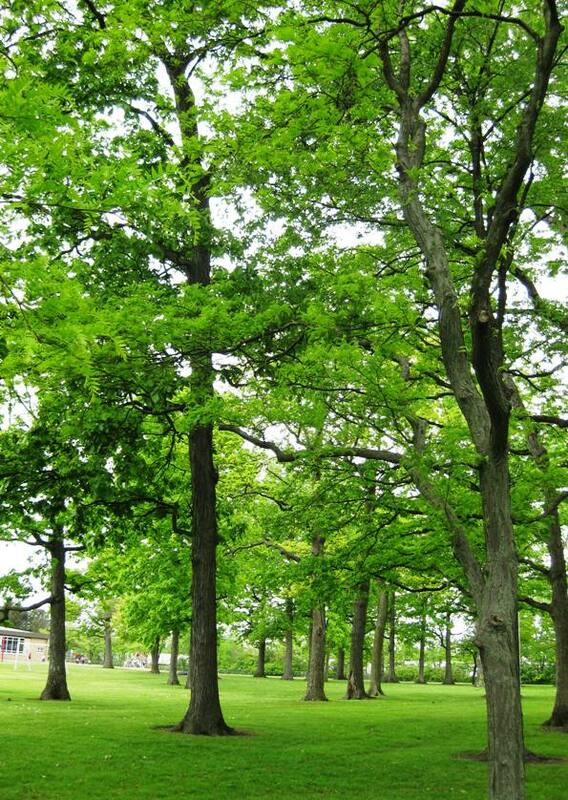 If you're a regular reader, then you know that the parks of Fort Wayne played a huge role in my childhood. Reservoir, Lawton, McMillen, McCulloch, Swinney, Foster, Psi Ote, Franke, Lakeside....each one unique but focused on delivering on the original spirit and vision set forth by Colonial Foster. I'm not a world traveler by any means however, I have seen my own fair share of parks and there isn't a better park system in the world. You all got it - right in Fort Wayne. Just two days ago, Mayor Henry and Parks Director Moll, kicked off a campaign which is very near and dear to my heart. This isn't just another park. Nor is this just a run-of-the-mill fundraising effort. Taylor Reuille, an 11 year old (and 5th grader at Harlan Elementary School), has been the driving force behind this effort. "I am raising money to build a Boundless Playground® for kids of ALL abilities. There are thousands of kids in Allen County with disabilities which include not only those who are in wheelchairs but also kids who are hearing impaired, visually impaired, and those with other disabilities such as Down Syndrome and Autism. Most of these kids are not able to play at a regular playground because the playgrounds do not accommodate their needs. If children with disabilities are not able to play at a playground, then why should I or other children who don't have disabilities be able to play? Currently, there is not a single Boundless Playground® in the entire state of Indiana. Children of all ages and all abilities need to laugh and have fun. I am asking for your help to make this happen." See if you can recognize any of these famous signs which I plucked out of the middle of pictures from the ACPL CONTENTdm library. Did your folks ever buy any appliances from Stucky's? And what about the First Federal Bank sign? Did you know that Sears & Roebuck used to be downtown - right next to Fort Wayne National Bank...until they moved to their location on Rudisill? Do you remember walking down the street, past the gold/bronzed presence of the Indiana and Michigan Electric Company? And while you were downtown shopping, did you stop in at El Chicano for some lunch? It was a great start before you headed a little further down the street to the ice cream shop. Okay - more for those of you who seem to like this stuff. And yes, I know I already included an Ayr-way before but hey - this one has The Fonz on it!!! Snider High School was just one of those high schools on the north side for those snooty kids ;). At one time, I know it was called R. Nelson Snider but at some point, people just started referring to it as Snider. Maybe they still do - maybe they don't - I'm just tellin' you how it was in my day. As often the case, Snider was named after somebody significant in Fort Wayne's history - Mr. R. Nelson Snider himself. Until recently, I really didn't know anything about him. And then, I came across this picture of him. It's from the South Side Totem Yearbook (1927). He was Principal there and kind of a hottie in his day! So I wanted to find out more about him. The first place I went - logically - was to the school (R. Nelson Snider) web page. How sad. Not one mention of him. Although you could click on a link to find out who your legislators are. And they're redoing the web site so there's also a page dedicated to the "Web Design Team". Kinda shabby that they wouldn't even talk about the history of their high school. Hope that doesn't mean that they are getting ready to rename it. I did find out at least something at Wikipedia. "The first high school built by Fort Wayne Community Schools in forty years, R. Nelson Snider High School, named for an outstanding educator, opened in the fall of 1964 with three hundred twenty-five sophomores, twenty faculty members, four administrators, and one secretary. In April 1966, the students and staff moved into the present facility after having shared Lane Middle School. This building has been renovated twice since then, the latest having been completed in 1982. There is an area of ten acres of building on a forty-acre complex housing more than two thousand students in grades nine through twelve. Part of the complex includes five tennis courts, a freshman and junior varsity football game field, a softball field, a soccer field, and an all-weather track. There are sixty-nine classrooms, a metal and welding shop, a wood shop, a main gym, an auxiliary gym, a wrestling room, a wellness center, tiered lecture room, three darkrooms, a foreign language cafe, a complete television studio, an auditorium, science laboratories, a cafeteria seating over five hundred, a five hundred-car parking lot, a suite of guidance and athletic offices, a main office, a student services office, an attendance office, and a media center which encompasses approximately 16,000 books and periodicals, 1800 non-print media items, and a 32-station networked computer lab in addition to several stand-alone computer work stations with access to electronic data bases. In December 1995, the staff voted to restructure the educational day to the 4x4 block format. The 4x4 scheduling format at R. Nelson Snider High School has students taking just four classes every day. There is more time for instruction and learning, with less time used for getting to and from classes and for classroom management. This productive use of school time translates into potential for additional labs, field trips, interdisciplinary activities and intense focus on subject matter. In 2006 or 2007, a cell phone tower will be built on Snider's grounds. Snider will receive a monetary payment for the tower, and has yet to decide what the money will go towards. As part of the contract, Snider will not be able to use the money towards scholarships." Huh - not much about the man (one sentence) but now I know about a cell phone tower! I had to go to non-internet resources to find out about R. Nelson Snider. 1) He was Principal at South Side for 37 years. WOW!!! 2) That "R" - that stood for "Roy". 3) He died in 1976 and is buried in Lindenwood Cemetery. 4) His father was a farmer. 5) He was a Director for the YMCA. 6) He was on the Anthony Wayne Area Council of Boy Scouts. 7) Fort Wayne Education Foundation (now "Questa") credits its roots to R. He was a lender of money to students who wanted to pursue higher education. Yep. There's more. But maybe those folks over at his name sake high school will complete the story. Oh and P.S. - they might want to mention the guy that architected their building - John Davis Martindale. It's always great to come across these gems....Hope they bring a smile to your face. What was there to do on Cedar Crest Circle? This was before VG (Video Games). Another big thing - the residents of this neighborhood were folks with limited incomes. For the most part (if they were employed) - they were blue collar workers (i.e. factories and construction) or worked in retail. And I say 'if' because the 70's were riddled with unemployment challenges in Fort Wayne. The "outdoors" was our entertainment. It didn't matter how old of a kid you were - you spent a great deal of time outdoors. Yes, even if it was colder than crap and hotter than hell. There were certain activities that became engrained in our neighborhood culture. Scott's Court (and if anyone can ever figure out for me why it's called that and who really owns this piece of land, I would be forever indebted to you) was a grassy area where we played red rover, tag, picked cherries from the cherry tree, and most importantly, it was the entry to the best ditch in the neighborhood. I kid you not. Let me back track a little bit. 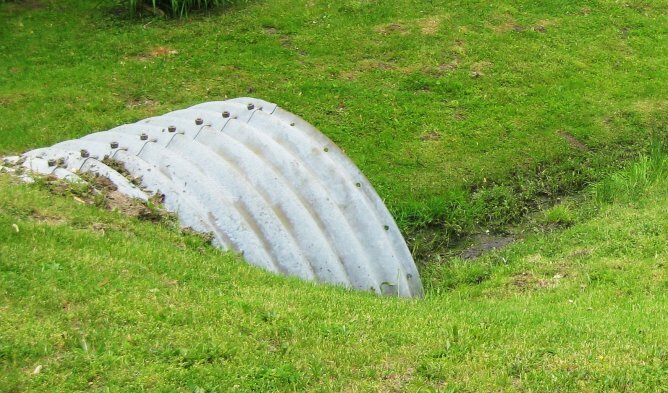 If you were a kid with a ditch next to your house - you were high up in the neighborhood pecking order. Oh yes. Now this particular ditch wasn't next to my house - it was across the street and down three houses. Still, very close in proximity and what made it even more special is that the folks who lived on either side of it had NO kids so you know...possession is like 9/10's of the law. In the 70's, the City of Fort Wayne (or maybe it was the county - who knows...) came out and re-did all of the ditches in our neighborhood. Those silvery shells created quite the opening. Inside, you could find all sorts of treasures. Rocks that looked like gemstones. Tadpoles. Lots of 'em. 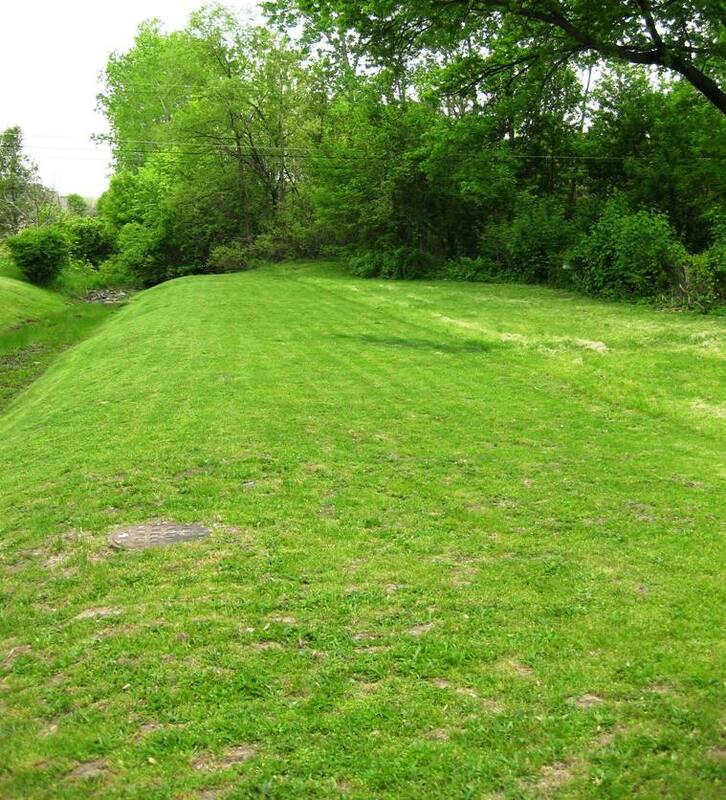 In this picture, the ditch-area is grown over with grass, but in my day, it was more rocks and water than anything else. This ditch was also the place where I had my first fist fight. You see, I was in sixth grade, and Rhonda and Rene Swanigan had moved into our neighborhood. 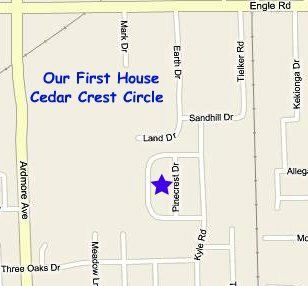 Although they lived on Pinecrest (which was the straight street that separated each side of Cedar Crest Circle), they felt the need to assert (or try to) their authority in the neighborhood. I hated them. They were the same ages as me (Rhonda) and my sister (Rene). I know it can be really tough moving into an 'established' neighboorhood. We didn't take too kindly to outsiders. We even were known for singing Help Me Rhonda whenever we talked about Rhonda. Hey - that's just the way it was. Everyone had a nickname or a song that was sung about them - new kid or otherwise. One day while riding bikes, we (a handful of miscellaneous kids) paused at Scott's Court. Rhonda and Rene decided to stop and taunt my sister Patty. Why? What was said? Couldn't tell you. All I know is that when I told her to take it back and leave Patty alone, she got off of her banana-seated bike and asked me what I was gonna do about it. So I pushed her. She pushed back. I hated her. And it felt good to pull her blonde roots out. And the fists started flying. We ended up rolling around on Scott's Court and then fell into the ditch where we continued to punch the crap out of each other. Kathy Boice (an older chick in the neighborhood) must have been alerted to the fight by her sister Jackie. She came over with her boyfriend Tom, and broke it up. This is my childhood neighborhood. I randomly went through and put the names of the families and approximated where they lived. I know I missed some. I asked my buddy Carl ahem to validate things but he must be too busy - off being the neighborhood association President or something ;). I showed this to my sister. She was pretty amazed that I remembered all of these people. We argued over the spelling of the "Manter's". She thought it was "Manners". I was right. She was wrong. Insert smart aleck remark here: I am so much smarter than my sister - nah nah nah nah nah nah. Is it obvious yet that I had a great love for the neighborhood that I grew up in? I was only here for seven years of my life yet those seven years were extremely important. It's where I learned a lot about human behavior. I learned how to play with others. I learned that taking risks sometimes meant reward and sometimes equaled negative consequences. I learned how to negotiate, how to stand up for myself, and what it meant to stand behind friends (and my sister too). I learned that death happens. And more frequently than it should. This includes people, pets, and plants. I learned that hard work = some positive payoff...whether that was an allowance (25 cents - thank you very much), a good grade, or an extra privilege. I learned where the boundaries were with friends, their parents, and my own parents. I came to understand what was socially acceptable and what was better left unsaid. I learned that a good imagination was better than a million barbie dolls (and associated accessories). I learned that boys were cute, smelly, annoying, and a must-have at certain times of your life. I learned that sometimes, no matter what you look like, people will always make fun of you. I learned that adults were just as vulnerable as kids - they were older, a bit wiser, but really didn't have stuff all figured out. Other stuff too I learned - but for now, that's a good enough list. Here's who they are - I swear - if any of them are reading this and I have butchered their names or called them 'suzie' when they were really 'tommie', I will feel mortified (so apologies ahead of time - and please correct me). In 1971, we moved into our first house. I think the house was built sometime in the early 50's and it was about 800 sq. ft. There were three bedrooms, a living room, one bathroom, and a kitchen. Our driveway had gravel (I'm assuming from May Stone and Sand). Our one car garage was detached from the house and sat to the left side and back of it. No remote opening. You had to jimmie the silver, metal handle (pull upwards) and then, pull up on the door. Reverse that to close your garage door. Everything - yes everything - we had from a home furnishing and home appliance perspective was used/passed down. Our clothes were too. But you know, I was none the wiser. I thought everyone lived like this. I look back and wonder, how the heck did the four of us (then the fifth with my brother Jason), manage to co-exist in such a small amount of space - 800 SQUARE FEET?! I don't have many pictures of my house from that time period so I've pulled together what I can in order to put the neighborhood into a socio-economic context. This house (below) is on my street. 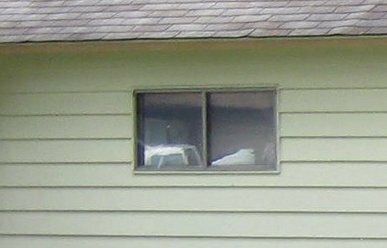 I specifically took this picture during my trip home in May 2008 because the house for the most part, is unchanged since 1971 and it was very typical of what all of the other houses looked like on the street - especially the location of windows and color of the siding. All of the houses pretty much looked the same. Very square. Very boxy. The siding colors were all neutral - 10 different shades of grey, some white, a few light tan. Not much different from the the shades my husband and I saw when we were looking to build our own home in the 90's. The windows were located up high - I guess so that people couldn't peak into your windows to see what you were doing. The windows were secured internally by a flip, sliding metal latch. Extreme hot or cold made the suckers hard to navigate. And sometimes, if you didn't have screens on the outside of your window, and you left your window open to take advantage of that cool breeze, a bird was liable to fly in. On the positive side, it was a good sized window for a room air conditioner - although you had to stand on a chair (with help from others) to get the pup in there. To be safe, someone needed to be on the outside to make sure that you didn't push the air conditioner out the window either :). The house layouts were also identical. I already posted a picture in a previous blog entry - of one of bedrooms. But here it is again. This was the "master bedroom" and at different periods of our lives, my sister and I shared this room as our bedroom. See - no carpet - just hard, cement, tiled floor. There were two other smaller bedrooms - both not carpeted. All the bedrooms were clustered together to one side of the house (in our case - right side and back). Our kitchen was tiny - but not that I noticed it at that time. 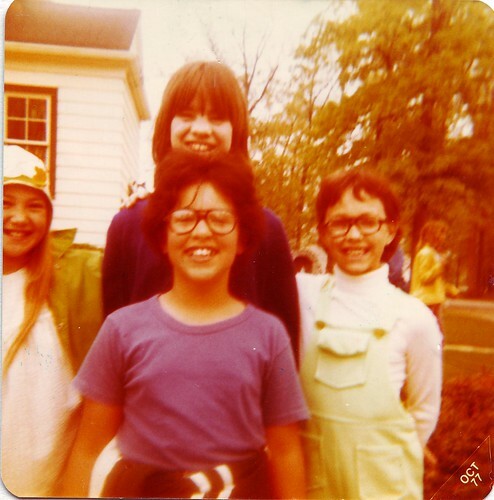 In the picture is my cousin Cindy (the birthday girl), me, and a distant cousin, Sherry. We're at the kitchen table. The dryer is in the corner, the back door to the right of that. What you don't see is - to the right of that, was the washer and the sink (no dishwasher - none except us kids!). The pantry was in the hallway and the refrigerator straddled the kitchen area and the hallway. To the left of that was the stove. Get all that? I think it was about 150 sq ft. Tiny, tiny, tiny. But me? I really didn't know that at the time. And did you catch the Scot Lad Brands?! On my flickr account, you can see a HUGE close-up on this particular picture (2241 x 1525). Go ahead. It'll crack you up. This is a picture of me and my cousin Cindy, in our backyard after my First Communion. Like my dress? My grandma bought it secondhand somewhere and it was passed on to my sister Patty and my two cousins, Cindy and Wendy to wear during their First Communion's. We had family over for a reception in our backyard. Our backyards were pretty big. My mom used to hang laundry out on the clothesline which she put up behind our one car garage. In the back of us (this picture) is our neighbor's house. It looked just like ours and everyone elses. One car garage (always detached from the house), windows placed up really high...Look closely, and you can see their clothesline. It's amazing to think back on this time in my life. I was so oblivious to what I didn't have. But gosh, I sure knew what I had and I appreciated it a lot. Sidenote: I specifically listened to songs from the 70's (maybe some were from the 60's too?) while I was writing this and I was amazed how freely the memories flowed. I could literally reach out and touch them :). I was born in Fort Wayne, Indiana, October 12, 1966 at Parkview Memorial Hospital (aka The Baby Barn). 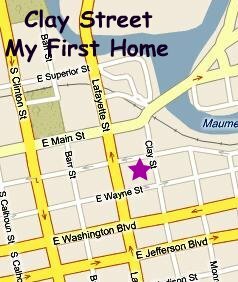 My first home was at 808 Clay Street - an apartment building owned by Clyde Briggs and managed by my grandparents (Wayne Roy & Irene Roy). When I was about 4, my parents rented a house in Ossian. When I was 5, they took the plunge and purchased their first home in Waynedale - 4719 W Cedar Crest Circle. I asked my mother last weekend - what in the world led us to the house on Cedar Crest? Seems that my dad had a drinking buddy - Howard Davis - and Howard's brother-in-law had just put his house up for sale (coincidentally - right behind Howard's). My mom felt strongly that we needed to put some roots down before I started Kindergarten. And that's how we came to the house on Cedar Crest Circle. My earliest memory of the house isn't the actual house, but the driveway. It was January and cold. I think we had a Ford Torino (red) and while my parents were in the house looking around with the realtor, I was sitting in the backseat with my grandma. My feet were frozen, and she had me take off my boots so that she could warm up my feet with her hands. I remember laying my head on her shoulders and telling her that she was the nicest grandma in the entire universe. I'm not sure I knew what a universe was - but I had the nicest grandma in the world - for sure. When I was a little kid, Broadway Street was the corridor to the Waynedale area. Yep - that's right - that street - which used to be one of the most famous (not to mention historical and notorious) streets of Fort Wayne - was the path that we Waynedale peeps took into the downtown area. As a car passenger, Broadway was like a familiar, yet undiscovered country for me. Turning left (from Bluffton Road) was like getting a history lesson in less than 15 minutes. Businesses (small and mom and pop types) were scattered in between the close-knit, early 1900's and post-world war I neighborhoods. There was always General Electric - massive - larger than live - a presence that was in essence - its own little city within a city. And restaurants were plentiful. Zoli's (2426), Old Mill (3514), Bob's Place (1031), Fort Wayne Lunch (1308), Julie's Restaurant (1418), Leto's Pizza (1019), Manochio's (927), Senate Grill (1009), Ogg's Ralph Bar and Grill (1916), and Broadway Grill (1416). Other businesses included (but definitely not a comprehensive list) Broadway Sewing Center (928), Maloley's (1101), Brass Rail Bar (1121), Koegel's Jewelers (1309), Norm's Glass Bar (1420), Custom Bilt (1908), Falls Tap (2012), Kirby Sales (2018), Swifty's (2024), Kip's Tavern (2034), Hire's (2042), Fort Wayne Lumber (2047), Broadway Car Wash (2202), Jocquel Supply Company (2206), Allen County Tires (2210), R&R Health Spa (2211), Hans Decorating Center (2215), Stookey's (2216), The Polka Dot (2219),Durnell's (2502), Speed-E-Clean Laundromat (2508), Marathan Station (2515), Broadway Home Bakery (2609), Martin's Heating (2626), Permafloors (2725), Magic Fingers (2726), Texaco (2740), Fort Wayne Mirror Works (2829), Allied Pool Equipment (2915), Montgomery's (3138), Broadway 66 Service Station (3325), Edward's Photography (3433), Tri-State Service (3434), Cosgrove's (3437), Compact Vacuum (3503), Randall's (3518). Everything I learned about how food works with my body - I learned from Timer.